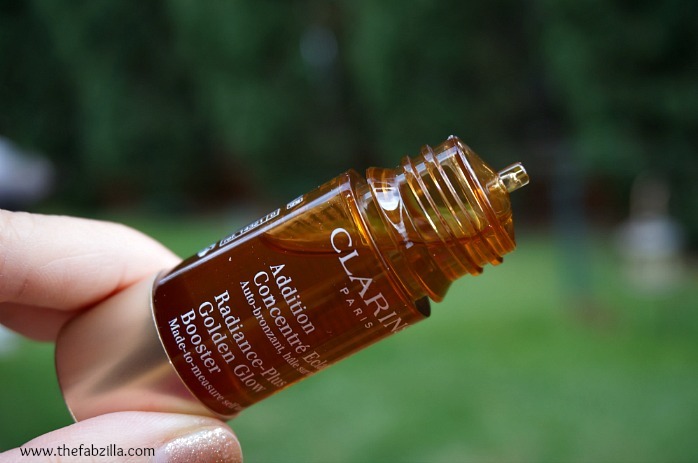 Still on the subject of faux tanning, I was more than intrigued to try Clarins Radiance-Plus Golden Glow Booster ($30, 0.5 fl oz). I mean, summer is almost here so it’s my perfect ‘lil excuse to add color sans sunbathing. But not to tanorexic level, mind you. 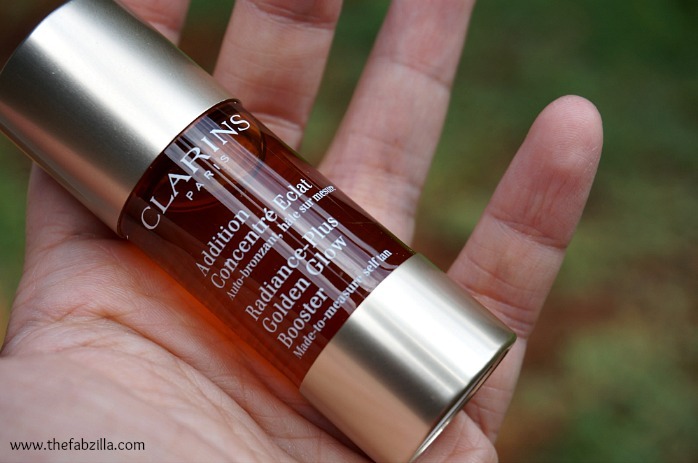 The idea behind Clarins Radiance-Plus Golden Glow Booster is to mix it with your current face moisturizer. 3 drops for tan and 2 drops to maintain the glow, for the next few days. So if impatience is your topnotch trait, this is not the product to instantly gratify your trivial want. Of course, I’m speaking solely from my experience. Some important points to remember: never use this alone and wash your hands thoroughly immediately after. Let’s cut to the chase. It took me almost a week of religious use to notice a barely-there tan. I started with two drops the first night and woke up with nada. Second to third night, still nothing. Impatiently irritated, I increased it to four drops the following night, still no glow. On the fifth night, I mixed four drops with a thick serum, applied it all over my face and neck, and sealed it with a moisturizer. Bam! I noticed some darkening the following day. And yeah, between the annoyance and eagerness to see results, I forgot to wash my hands thoroughly that it stained my palms! Now that I have cracked my own “application morse code”, I will continue to use it all through summer but not enough to warrant a repurchase. Impatient is my middle name. Have you tried this? What’s your go-to face self-tanner? That seems like an awful lot of trouble to get it to work! <3 Tell me how you like it a little later on! Yeah this wouldn't work for me. I wouldn't buy. I need that instant gratification. I have read some mixed reviews on this. I am very intrigued, but I do agree that is a lot of trouble for a bit of color. I am curious to see if it starts to work better soon. And I also wonder if using everyday how long that bottle will last. 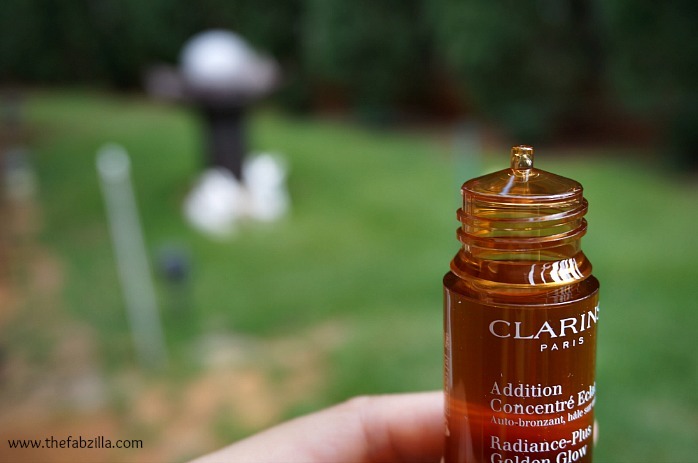 I don't self tan, but if I did I would use other Clarins self tanning products for the face. Sorry it didn't give you the results you wanted sooner. Well, that's annoying. It probably wouldn't work for me, either. I kind of like the whole slow buildup. No risk of over doing it. Hmm I think it might be a little too high maintenance for my taste! I love this stuff! It gives me just enough color and looks quite natural. I'd say I noticed a difference by the 3rd day. I serriuosly need instant results to be impressed. It does seem like work. But I bet it will be worth it. Girl… I am so impatient… i don't think I can wait for it to work. This is sounding like the bronzing serum from Tarte I'm testing out right now. I can't get the instant results! Any kind of tan makes my skin look dirty, but maybe something super gradual like this would work. Yikes, too much trouble! Plus I get enough of a little tan from wearing sunscreen and being outdoors. Hmm that's a bit much for me! I am pretty impatient too! I need RESULTS! I like that you can mix this with your own favorite moisturizer, but I like to see results sooner than 5 days!